This handwash seems expensive but is totally worth the ‘extra’ francs It comes in an amber-coloured 500ml bottle and costs CHF40, available at -Globus or online. The lightly textured liquid exfoliates and smooths your hands, leaving them silky and smooth. The scent is slightly masculine and woodsy but doesn’t linger and is not unpleasant at all. I don’t feel this is as expensive as it seems considering the amount you get and that it not only cleans but also exfoliates your hands. “Hyper-saturated, water-resistant liquid eyeliner with an innovative flex tip and easy-grip triangle shape for effortless no-limit lining that lasts.” The tip of the product is perfect for a sharp wing. Once dried down it has a silky sheen appearance and is not matte black. The eyeliner itself is quite wet, which could lead to bleeding/smudging, so you need to be careful that the product has dried down to avoid it transferring to your brow. To avoid it bleeding, it’s a good idea to use an eye primer or concealer. I love LOVE this shampoo!! I love the slight cooling, tingling feeling as my scalp is being cleaned and after my hair is squeaky clean and smelling amazing! This product has a very thick consistency which leaves a greasy white cast which reminds me of being a kid at the beach when you were so covered in sunblock that you looked like a ghost. As a mineral sunscreen, it contains 14% zinc oxide and 5.44% titanium dioxide and antioxidants which is good value for money considering The Ordinary’s price point. 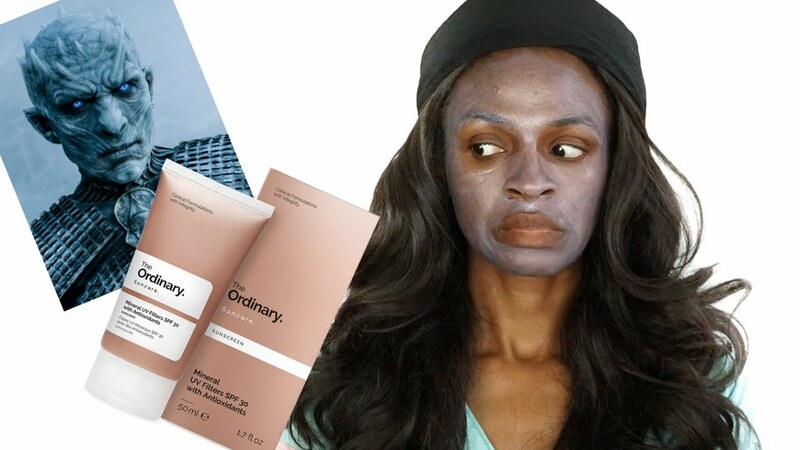 This product would work for someone with fair complexion or who wears heavy foundation, if you have a darker skin tone and don’t wear a foundation over it, this product is not for you. I found these two YouTuber’s reviews and took screenshots of the white cast. I love BeautyFrenzy’s thumbnail and the expression on her face! Needless to say, I will not be buying this again. At first, I thought this product would be my new holy grail in makeup remover. I did a small patch test using it to remove eyeshadow swatches on my arm and it worked quite well, softening the product and wiping off clean, leaving only a slight oily residue. However, when I used it on a full face of makeup after a long day, I ended up a greasy mess, with somewhat melted makeup. The charcoal granules in the stick are quite big and rough and hurt the sensitive skin on your face. Even after attempting to rinse it off, my face was still greasy and I didn’t feel like it emulsified enough. I would not recommend buying this (at a cost of CHF25.90, it’s just not worth it), instead, I’ll be staying with the dermalogica precleanse oil and balm.